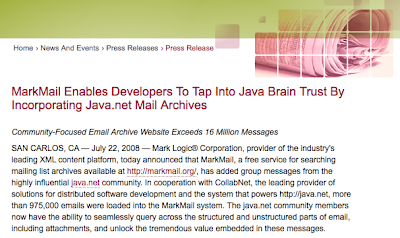 Last week, in collaboration with Sun and CollabNet, we loaded the mail archive histories for java.net, Sun's open source developer playground for Java projects and home to projects like GlassFish, jMaki, AppFuse, Grizzly, Hudson and WebWork. Just about half the java.net mails are auto-generated as a result of checkins or bugs. If we remove those, the curve is still beautiful. Looks like people are writing more than 15,000 human-to-human emails every month on java.net. With such a large community, it's fun to look at community-wide analytics. It's a little-known feature that you can go to our browse page and add an arbitrary query to the URL and it'll show you list-by-list numbers for all messages matching that query. For example, you can view the total number of messages per list throughout time, or the counts for just last week. You can browse the lists where people from "sun.com" have written the most. If you want to see the top lists, do it as a regular search. There's been a lot of coverage about this, from Marla Parker, Eduardo Pelegri-Llopart, Clark Richey, and javaHispano. Plus we issued our own press release! Congratulations - an impressing growth. Nice to know such a big community. Congratulations on being named a Blog of Note this week!